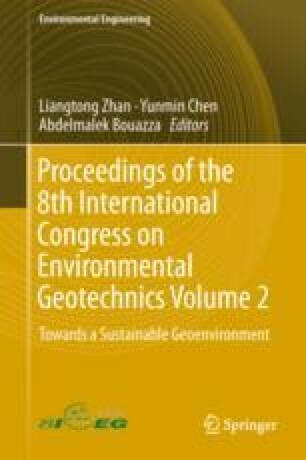 This report describes a pilot test at Tianziling MSW landfill to assess the feasibility of lowering the leachate level using horizontal wells. Three horizontal wells S01, S02 and S03 (length 50 m, 56 m and 55 m, respectively) were successfully installed using the improved directional pipe-protected drilling method. The average leachate flow rate of S01 and S03 were 10.66 m3/day and 3.93 m3/day, respectively after installation of the pipes. After 94 days draining of S01, the maximum and average leachate level drawdowns around S01 were 2.7 m and 1.7 m, respectively. After 42 days draining of S03, the maximum and average leachate level drawdowns around S03 were 1.5 m and 1.1 m, respectively. The radius of influence for S01 and S03 were in the range of 40–50 m. This test in general demonstrates the effectiveness of horizontal wells in lowering leachate level of MSW landfills. The obtained experience can be useful for civil projects that have similar concerns of draining the ground water. The work was supported by the National Natural Science Foundation of China (Grant Nos. 51578503 and 41502276), and the Major Science and Technology Projects of Zhejiang Province (Grant No. 2015C03021). Great thanks to Hangzhou Environment Group Co., Ltd and Sinohydro Foundation Engineering Co., Ltd.